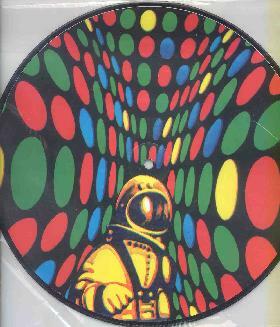 Mandra Gora Lightshow Society - "Space Rave"
I'm gathering that this 10" vinyl release is the closest we have yet to a follow up to Mandra Gora Lightshow Society's Beyond The Mushroam Gate CD, and it features the same killer brand of psychedelia that the band served up on that release. Side A includes the songs "Love Dies", "Betty Day", and "This Sweet Pain". The trip factor is highest on "Betty Day", my favorite of the three. This is the kind of stuff where you just have to project liquid lightshows behind the band and go-go girls dance at the sides of the stage. It's got a killer 60's sound, but Mandra Gora Lightshow Society are infinitely spacier than the 60's psychedelia they draw from. And on all these songs the band have a funky rhythm to the music that makes the body want to MOVE! All of Side B consists of "Psychedelic Shiva", a jam recorded live at the 1999 Hawkfan Festival. It starts as a song similar to those on Side A, but quickly launches into a cosmic tribal space jam with frantic driving rhythms and mind-melting space guitars, and that organ that gives the band such a beautiful sound. Timo is a man possessed on vocals, not unlike an impassioned Jim Morrison. The band really stretches out across the song's 15 minute length. These guys really do an excellent job of blending the psychedelia of the 60's with a more modern space rock sound. Highly recommended. Hurry up because this is a limited edition of 1500. And it's on a beautiful picture disc too. God I LOVE that organ. For more information you can visit the Swamp Room Records web site at: http://www.swamp-room.de/.